Two people have been charged with manslaughter after a 73-year-old woman died 11 days after being mugged. The woman fell over and dislocated her shoulder when a man tried to take her handbag on Petersfield Road, Hall Green on 5 February. She was released from hospital after being treated but was re-admitted on 15 February and died the following day. A 15-year-old boy, who cannot be named, and Marius Lucian, 21, are due before city magistrates later. Mr Lucian, of Lyncroft Road, Birmingham, and the boy, also from Birmingham, are charged with manslaughter, robbery, and assault with intent to commit robbery. Four other people, aged between 14 and 22, who were arrested have been released on bail, West Midlands Police said. The force said the woman's cause of death had not yet been ascertained. 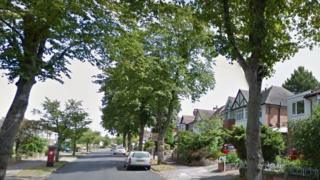 Two other women, aged 57 and 67, were also targeted within hours of the first robbery taking place, both in Acocks Green.